Here’s an interesting twist for your “something blue”, a blue tattoo! Although a lot of brides ask that you cover up tattoos on their wedding day, many also do not. 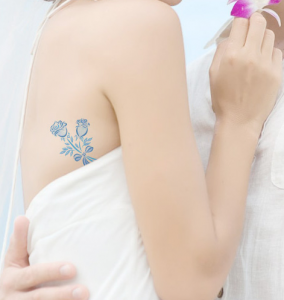 I DO TATTOO provides Temporary Blue Bridal Tattoos for your big day! These temporary tattoos are available in 8 designs and are 2” x 2” in size.